Wild mustard sprouts up in early Spring as small green leafy bunches close to the ground. In fields with rich soil and partial shade, it can grow into knee-high bushy clumps with foot-long leaves splaying outward and upward. At this stage of growth, the larger leaves are perfect for cooking like store-bought mustard greens. The taste is tangy and spicy. Once its flowers start appearing, the plant drastically changes appearance. The large bushy leaves dwindle away to small stiffer leaves around the base of the flower stalk. 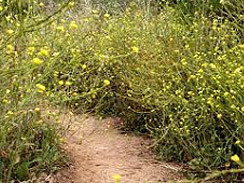 The flowers themselves are soft bright yellow and small, tangy with a spicey taste of mustard. Toss flowers in salads, or just pop into your mouth while hiking. Several wild mustard species grow in my hills. Wild Black Mustard tends to be the spiciest. It’s much less common that other varieties here in So Cal, tends to grow near water or shade, though not always. 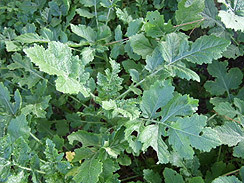 Unlike more common varieties, black mustard leaves are hairless, its stems may have a purplish tint, its flowers are larger, it grows up to 8′ tall and has black seeds. The more common variety, Wild Field Mustard, is less spicy, shorter, has fury leaves and smaller brown seeds. Cut cleaned mustard leaves into 2″ wide strips. Heat olive oil in pan over medium high flame. Quickly saute garlic without burning, add onions, saute for 20 seconds, add greens, saute for 45 seconds turning several times with spatula. Sprinkle on vinegars, producing steam. If mustard is still not tender enough, cover pan with lid to steam until tender, not mushy. Remove from heat, toss in sesame seeds. Lightly salt to taste. This recipe is a variation on the classic dijon mustard condiment. Classic dijon is made with verjuice, which literally means green juice in French. Verjuice is acidic juice squeezed from sour unripe fruit, most commonly grapes. Here in SoCal, grapes happen to be at the perfect stage for verjuice just as Black Mustard seeds are perfect for harvesting. For this recipe, I used organic grapes foraged here in the neighborhood. Gather Black Mustard seeds when the pods have completely dried and turned fully brown. You know the pods are ready for harvesting when you can hear the seeds rattling inside when shaken. Remove seeds from pods by rubbing between your hands. I held 2-3 stems together, and rubbed them back and forth in my hands until most of the seeds fell into a bowl. Use a fine mesh strainer to filter chaff from seeds. Harvest a cluster or two of sour green grapes. Extract their juice and set aside. Coarsely grind 3/4 of your wild Black Mustard seeds, holding back 1/4 of them back to use whole. Grinding with an electric spice mill is the fastest way, or you can spend a very long tedious 1/2 hour grinding with your hand-cranked pepper mill (I did, lost its charm pretty quick). Immediately combine ground Black Mustard with mustard powder in a small bowl, adding 1 tbsp cold water. Timing is important, as mustard begins losing its sting once the seed is broken. Stir water into the mustard mixture slowly adding the remaining cold water as needed, bit by bit, to make a paste. Be sure to use cool or cold water; mustard’s trademark zing is only activated when the broken seed is exposed to cool non-acidic liquid. Allow to stand for 10 minutes. After 10 minutes of activation, it’s time to add your verjuice. The acidity of the verjuice (or vinegar if you choose to substitute) chemically interacts with the mustard’s other process, locking in the “zing”. 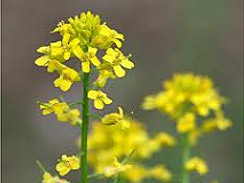 Without this interaction, the water-mustard mixture would quickly mellow, losing its bite. Add salt, stir. Now set the bowl aside on your counter, away from sunlight, and allow it to cure for at least 12 hours. 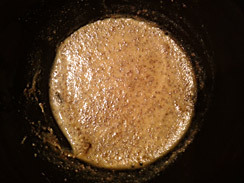 Right after adding verjuice (or other acid), your mustard will have a bitter taste. This bitterness subsides over time. Try tasting a bit with your fingertip after 12 hours. Then try 12 hours later. Some folks cure their mustard for several days before arriving at the taste they’re looking for. Once you find that zone, move to the refrigerator, as your mustard’s taste will continue to mellow if left unrefrigerated. BTW, mustard, salt and acid are all natural preservative, so you run no risk of spoiling while curing.